"With mindfulness, you can recognize that the mind’s messages can be either used or discarded, and that the choice is up to you. You are the human; the mind is the mind. A core feature of mindfulness is that you can see your mind’s messages like information on a computer screen, weigh the merit of those messages, and then choose what to do, including following another path entirely. Your mind doesn’t run the show; you do!" The emphasis of In This Moment is on brain training, based on recent research about the neuroplasticity of the brain. There are extensive explanations of the physical response to stress in our bodies and brains, and how these negative effects can be mitigated or even reversed through a consistent mindfulness practice. We begin by observing how we’re affected by daily stress and recognizing our typical avoidance strategies. This is followed by a self-assessment scale of the five facets of mindfulness, then a more detailed explanation of each "facet" and several exercises to increase our skillfulness in that area. Observing: "Learning to focus your attention is important because when you’re under stress, your attention tends to splinter. You may find that you lose your focus and jump from one thing to another as the physical arousal of stress activates restless mind… This overactivation of your nervous system and the persistent shifts of attention it creates can make you less organized and effective in responding to daily stress." Describing: "Most stress reactions are bundled in such a way as to produce an overwhelming array of physical sensations, memories, and emotions within a matter of seconds. Using words to describe your immediate experience helps you unpack these components of the stress reaction... This will help you slow down... and be much more deliberate in your responses." Detachment "involves anchoring your awareness in the important distinction between you and your immediate reactions… You are not the same as your reactions. Rather, you are the person who is aware of your reactions." Love Yourself: "Practicing self-compassion... means understanding and accepting the inevitable reality that you will make mistakes, not meet your expectations for yourself, or fail in important life pursuits…[It] requires that you detach from self-defeating personal narratives, however rational and realistic they might appear at first glance." You are Awesome!/You are Flawsome! Act Mindfully: "Ultimately, this is the most important step you can take to transcend daily stress: making an ongoing commitment to living life on purpose, based upon what’s important to you, rather than in reaction to the stress you’re under." The book ends with two chapters giving advice and exercises for mindfulness at work and in our relationships, in order to find more meaning and connection in our daily lives. 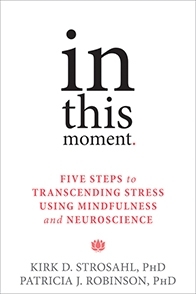 Because of the emphasis on brain research, I’d recommend In This Moment particularly for people who are interested in a scientific rather than spiritual approach to mindfulness. However, the exercises themselves are appropriate for any adult (and most of them would be appropriate for sharing with youth, as well). With permission from New Harbinger Publications, next week I’ll post a sample exercise, Restless Mind: Typical Strategies for Denying Stress.